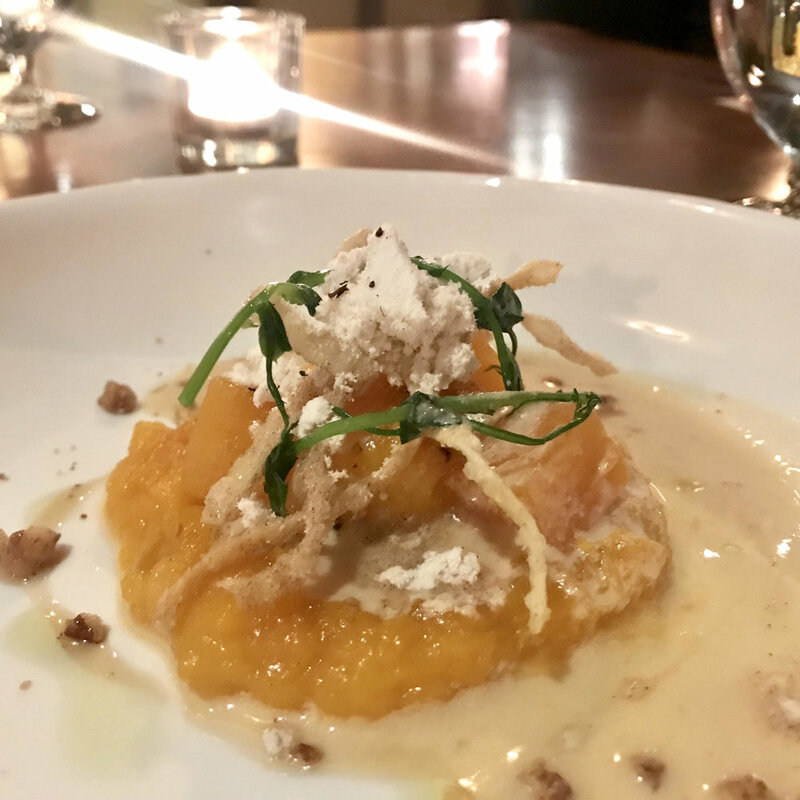 Located in Pittsford Village, The Kitchen is a fresh interpretation of fine dining from Chef Joseph Cipolla. The Kitchen offers an intimate culinary dining experience in the heart of Pittsford Village. 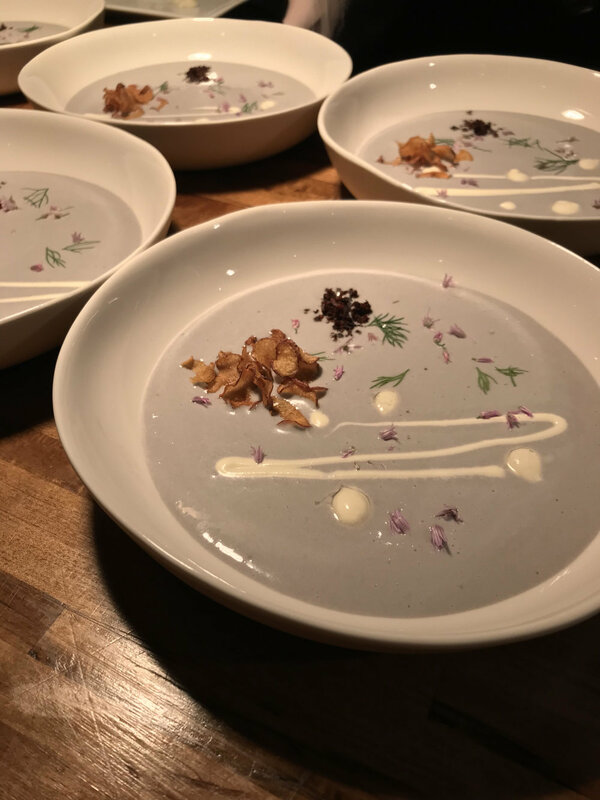 Enjoy a seasonal multi course menu or order from our a la carte menu, comprised of regionally sourced ingredients and beautifully presented by Executive Chef Joseph Cipolla. 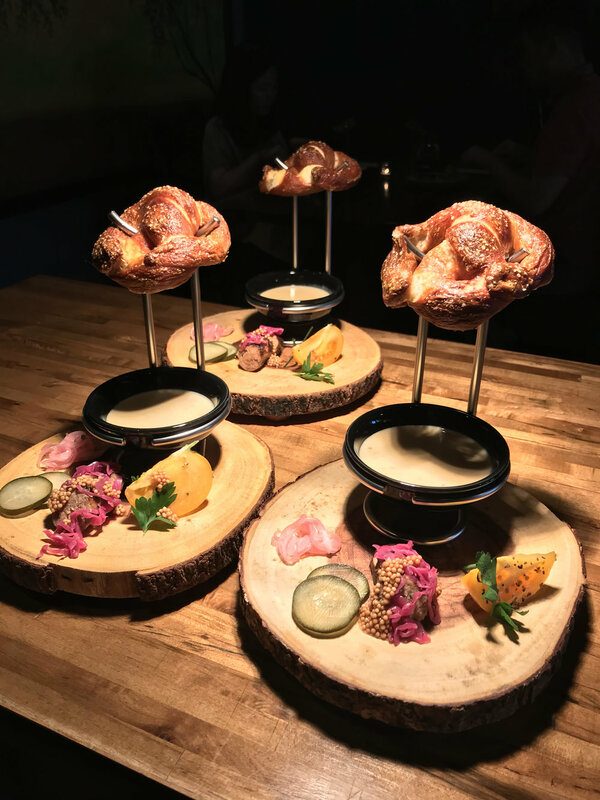 With the final preparation of each course in the dining room, patrons will be immersed in the art of cooking and share Chef Cipolla’s passion for haute cuisine while seated comfortably at custom built live edge tables made from local black walnut. Reservations may be made for parties of 2-20. Walk-in guests will be seated first come first serve basis. We offer a wine pairing designed to work perfectly with each menu, and limited wines by the glass and bottle as well champagne. Patrons are welcome to BYOB wine and beer with a $15 corkage fee per bottle. BYOB Beverages must be established during reservation confirmation. We offer a chef’s tasting menu for $75 per person or an a la carte menu. *Please note* that the entire table must agree on the style of dining. *Effective 4/17/19 | | Due to the intricacy of this menu, we are unable to accommodate vegan, gluten-free or dairy-free guests. We offer a Wine Pairing designed by our Sommelier to perfectly complement each menu. A selection of craft beers are available by the bottle. We welcome our guests to bring their own special wine or beer beverages. However, there will be a modest ($15) corkage fee per bottle for as many bottles as you would like to bring for your party. Please check for dates below to make your reservation online. Service starts promptly at the reservation time. Reservations require a credit card to hold the date. A confirmation call will be placed 24 hours prior to confirm your dining specifics for the evening. If you are unable to make your dinner date you may reschedule for a later date. A no show or cancellation past the 24 hour period will be charged a 20% fee per person, per our cancellation policy. BYOB wine and beer is allowed and must be established during the reservation confirmation. There is $15 corkage fee per bottle and appropriate glassware will be provided. Coffee and bottled refreshments are available for purchase as well. If you would like to be on our waiting list for last minute cancellations, email waitlist@cipollaromaine.com with your name and phone number. "For some people, food is just what you do...for me, it's my life." Born in Rochester, New York, Joseph Thomas Cipolla found his passion for cooking at an early age: from watching his Greek grandmother cook everything from scratch. "This is why they keep coming back," she said to young Joseph. Later, when he heard stories that he was the only one she ever let into her kitchen, he knew where his heart belonged: the kitchen. As soon as he could work, Joseph made his way to the kitchen, from prepping food at various restaurants at age 14 to assuming the role as sous chef at a local Italian bistro at age 17. Realizing he was ready for his next step, Joseph moved to New York City, where he attended the French Culinary Institute, studying haute cuisine under the tutelage of Jacques Pepin and Andre Soltner. With an education in hand, he landed a plum position at The Pearl Room, a Brooklyn based seafood restaurant owned by renowned executive chef Anthony Rinaldi. In record speed, Joseph, now 20, worked his way to sous chef. Soon thereafter, the Pearl Room earned an American Michelin star, the only restaurant in Brooklyn at the time to carry such an honor. 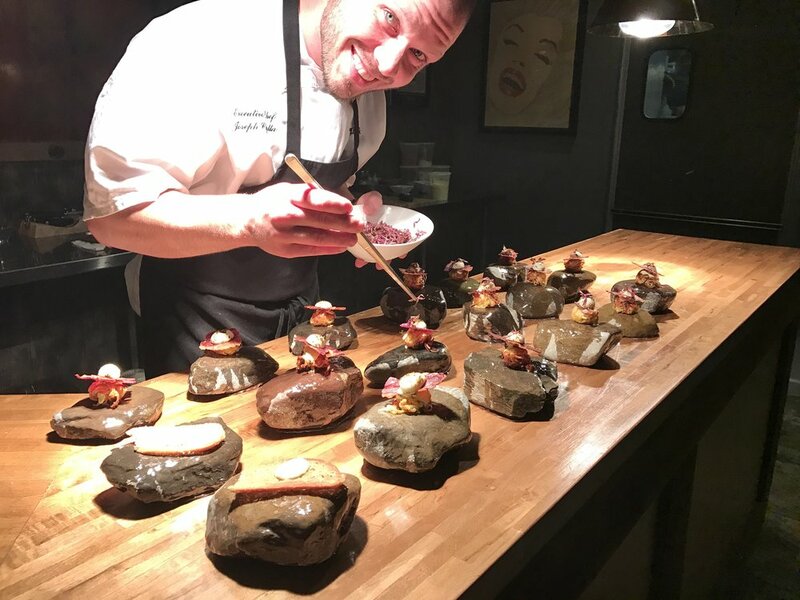 Continuing his ascent, he moved on to manage Restaurant 101 in Staten Island, where he made the must-watch list for young chefs. In 2006, Chef Cipolla moved back to Rochester, New York to open and serve as executive chef at the acclaimed downtown restaurant Eros. From there, the prestigious Genesee Valley Club recruited him for the lead chef position at their onsite restaurant, the Armstrong Grill. A chef on the rise, he was then snapped up by Monroe Country Club, one of Rochester's most elite clubs, to be their seafood and game chef de partie under executive chef Frank Mirabile. Eager to start his own business, Chef Cipolla took his career to the streets in 2011, buying his first food cart: Scratch Open Kitchen, a gourmet food cart and catering company. Two years later, he partnered with David Romaine of Lettuce B. Frank and launched Cipolla Romaine Inc., a new concept of full-service catering and wedding planning with custom, client-driven menus. In short order, they opened a successful BBQ cafe at Three Brothers Wineries & Estates called Smokin' Bagg Dare. The Kitchen, launched in Dec 2014, is truly the realization of a dream for Chef Cipolla and reflects his passion for beautiful food, perfectly prepared. "I have really done a little bit of everything," says Chef Cipolla. "The Kitchen is a combination of my studies, world travels, and passion for food. While I have never been wedded to any specific cuisine, I have always kept my roots in French technique. I cook the food I truly love to make; and I use regional ingredients at their peak and with sincere respect."